Purim is approaching, and while I haven’t decided on a costume, I did decide to dress up my hamentaschen in Middle Eastern outfits. Hamentaschen are traditional Ashkenazi Jewish cookies notable for their three-pointed form, which according to tradition resembles the three-cornered hat of Haman, the holiday’s antagonist. (In Hebrew, for some reason, they’re called oznei haman, or “Haman’s ears.”) Last year I dressed up my hamantaschen as Japanese-inspired mochi cookies, this year I they resembled Middle Eastern pastries. The Purim story is set in first-century Persia, so it’s unlikely that Mordechai, Esther or Haman ever had baklava. 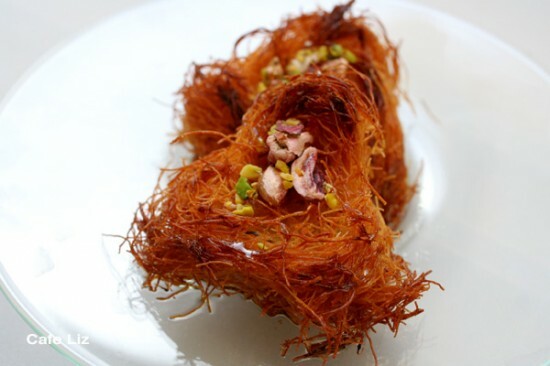 While the Persians (or Ottomans) are thought to have invented baklava, filo came into being only somewhere between the 6th and the 10th centuries. But still, it’s a twist that makes me smile. 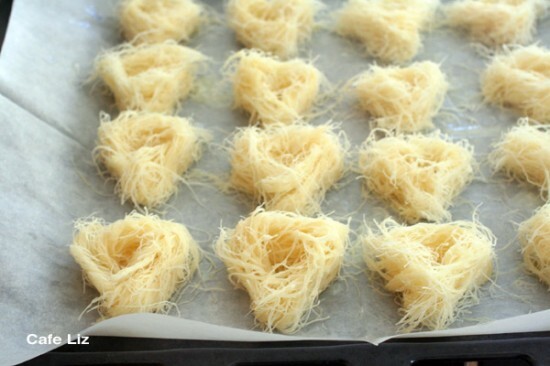 Bird’s nests are made with thin, noodle-like kadaif pastry. 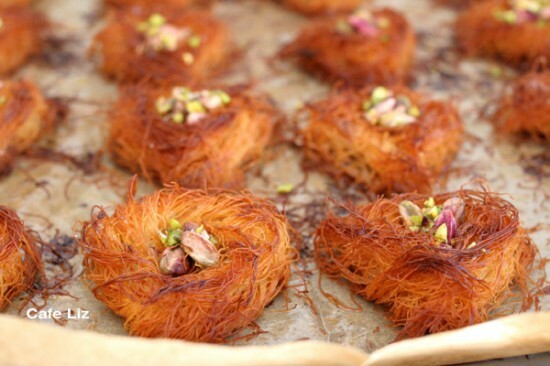 Kadaif is the basis for treats including knafeh and various baklava varieties, which are particularly easy to make because most kadaif is purchased premade at this point. My kadaif came from the Yom Tov deli at Levinsky 43, where it cost 15 shekels for 500 grams. Basically, you thaw it, slather it in butter, shape it and bake it, sticking in a few nuts for good measure. When working with kadaif, don’t let it dry out — let it thaw out in the bag, and keep it covered as you’re working with it. I leave most of it in the bag, and take out enough for 3-4 cookies at a time. You’ll need to tease apart any clumps, and you can cut extra-long strands with scissors. When you’re done, you can return the unused noodles to the freezer. For the filling, you can use whatever kind of nuts you like. I chose pistachio, because they have a delicate mix of pink and green that adds vibrancy. Plus, they taste good. I stuffed my bird’s nests once they came out of the oven, because I didn’t want the nuts to brown. Let your kadaif noodles thaw in the bag for about 30 minutes. Preheat the oven to 150 degrees Celsius (300 Fahrenheit). Melt the butter (I microwaved it for a minute). Line a large baking tray with baking paper. 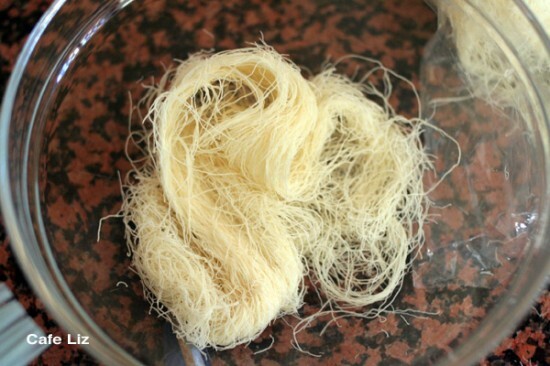 To form the nests: Take a chunk of noodles, lay them out in a long strip, and brush generously with butter. Twist the strip a few times in order to make a loose rope, and then wind the rope into a coil. 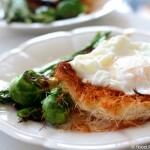 This should give you a round nest. Press in the sides to make a triangle shape, and poke your finger gently into the top to make sure there’s a hollow. Put the triangle on your baking tray. Repeat with the rest of the dough, to form 16 nests. You may not need all the butter (I brushed the rest on top of my little triangles). Put the nests in the oven for 10-15 minutes, until golden, but don’t let them become dark brown or burn. Some of the noodles inside the nests may still be white when you’re done baking. While the nests are baking, make the syrup: Put everything in a saucepan and bring to a boil. 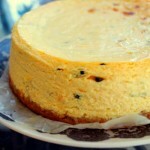 Let it cook for 10-15 minutes, too, or until the liquid has a thick, syrupy consistency. Set aside three pistachios for each nest (a total of 48) and crush the rest. I would have used my coffee grinder if it hadn’t had coffee in it. 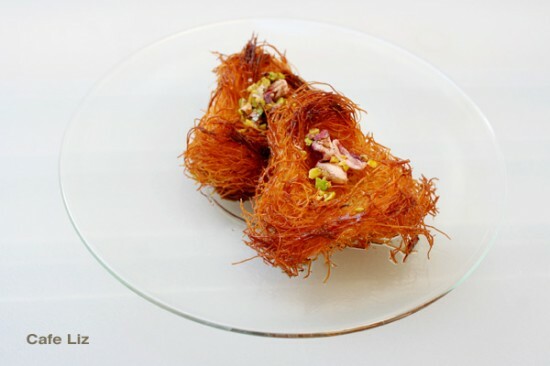 Once the nests are out of the oven, sprinkle a small bit of ground pistachio into each nest and then press in three pistachios (or chopped nuts of your choice). Drizzle with syrup — I used about 1/3-1/2 tablespoon for each nest, because I didn’t want them to be too sweet, and had some syrup left over. (You could use more syrup if you want, though — to taste). 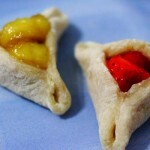 11 Responses to "Purim special: Hamentaschen-shaped bird’s nest baklava"
That’s a first! Every year there’s a huge competition between cafes and patisseries about the annual combination and stuffing. Yours wins! It is Very Beautiful and very original! These are really cute. My kids will love this shape. Heh. I actually was wondering why there isn’t the same kind of competition to create the most creative hamentaschen like there is for donuts at Hanukkah. I seriously haven’t seen anything too interesting …. I wonder what I’ve been missing …. This is something completely new, never seen anything like it before! They are so pretty! Once again you have shown your originality. Great blog. Hi, these look amazing, how long will they keep once they are made?